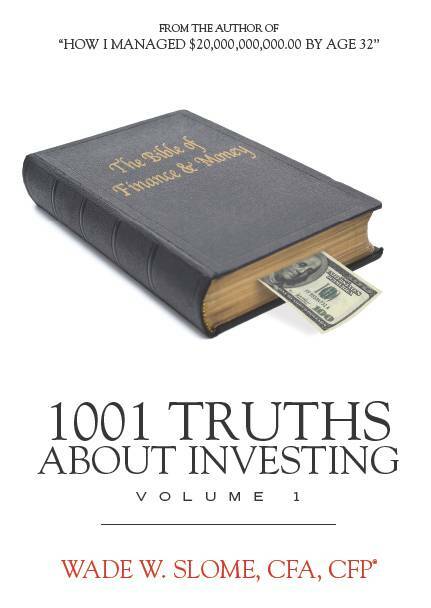 1001 Truths about Investing – Slome’s newest book now available! Price: $23.95 plus shipping and handling. Editorial Reviews: Slome provides valuable insight into the high pressure, extremely stressful life of a big time portfolio manager. Aside from professional sports there are few professions where one’s results are tabulated on a daily basis which can result in quite a rollercoaster ride. I’d highly recommend this book to anyone contemplating a career in the money management industry or for those who want a clear inside perspective of what it is really like to manage billions of dollars of other people’s money. Don’t listen to the talking heads on TV. Instead, let Wade Slome tell you what it’s really like to run one of the largest mutual funds in the country. And don’t be fooled by all the zeros, the lessons he learns along the way are applicable to anyone with a stock portfolio, no matter the size.